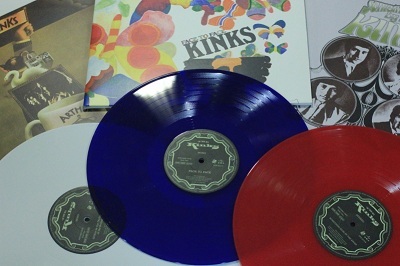 The Kinks jump on board for Record Store Day 2012 with three vinyl reissues; classic albums ‘Arthur’ (Or the Decline and Fall of the British Empire)’, ‘Face To Face’ and ‘Something Else’, released April 21st on Universal. Based around fictional character Arthur Morgan – a carpet-layer inspired by Ray Davies' brother-in-law Arthur Anning – ‘Arthur’ is a canonical Kinks concept album from 1969. This 2-LP edition reissue comes on white coloured vinyl. ‘Face To Face’ was released in 1966 and represents the first full flowering of Ray Davies’ songwriting; narrative-rich, with wry social commentary. Consisting entirely of his compositions, it heralded the band’s move away from the hard-driving rock and roll style of 1964-65. This 2-LP edition reissue comes on blue coloured vinyl. ‘Something Else’ was the fifth studio album by The Kinks, released in 1967 and features three songs composed by Dave Davies, including the hit single ‘Death of a Clown’. This 2-LP edition reissue comes on red coloured vinyl. All 2-LP editions, these three vinyl reissues come with deluxe packaging – with Mono and Stereo mixes – and booklets designed by award winning art director Phil Smee, packed with rare and unreleased images from the era. Each reissue was re-mastered from original tapes by Kinks archivist Andrew Sandoval and is limited to 500 copies in the UK, all of which are individually numbered.